When the financial crisis hit in 2007–8 the moderate left in the UK was faced with a choice. Option A: develop and share an account of political economy that did not take its bearings from the British Bankers’ Association. Option B: stick to the assumptions and taboos of polite opinion, however deranged, and hope for the best. In the 2010 and 2015 elections they chose Option B. Little good it did them. Their grudging acceptance of the pre-crisis common sense proved no match for the right’s enthusiastic insistence that the state had spent too much and sacrifices would now have to be made. 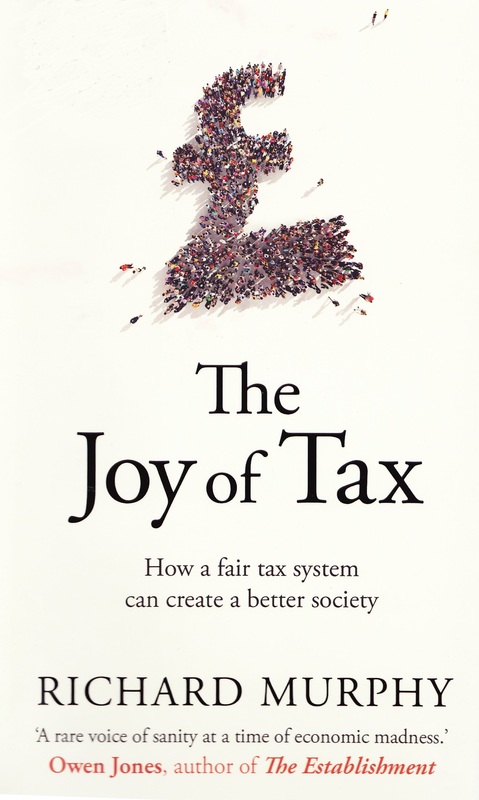 Murphy’s latest book, The Joy of Tax, is a frontal assault on this orthodoxy and the dangerous policies it legitimises. It is nothing less than an attempt to refound social democracy in light of what we now know about banking. Not surprisingly, given his tireless work as a campaigner for tax justice, Murphy begins the book with a lively defence of taxation as an instrument for securing collectively agreed objectives. But he is careful to frame his discussion of tax in a wider account of the state and its relationship with the economy broadly defined. To do this Murphy sets outs an explanation of the origins and nature of money. Money, whether created by government or by banks is debt. It is lent into existence and destroyed through repayment. And, as quantitative easing showed, the state can, if it wishes, lend money to itself without any of the dire inflationary consequences that the conventional wisdom predicts. All this is both incontrovertibly true – Murphy quotes the Bank of England’s own slightly exasperated efforts to explain where money come from – and somehow unspeakable in mainstream media and politics. Once the fact that money is debt is established, the rightwing insistence on austerity starts to look like a kind of artful incompetence. Conservatives stagger about like stage drunkards and whenever they trip on their never-ending journey to a balanced budget they pull another lever that enriches the rich and strips everyone else of long-established social protections. Every pratfall gives them more of what they want. We can either have state-created money or bank-created money. Either way we are going to have debt. If we won’t or can’t borrow enough to keep ourselves employed then the state will have to step in and borrow on our behalf – from bondholders or from itself. Far from shrinking, the state must extend the range of its activities to make up for the shortcomings of the private sector. With disarming cheerfulness The Joy of Tax dismisses fiscal austerity as a nonsense we can happily be without. Having dismantled the case for austerity Murphy goes on to explain the role tax plays in the really existing economy and cheerfully butchers the arguments of his long-time adversaries in the right-wing think tanks along the way. Once he has cleared away the fallacies and special pleading he sets out a comprehensive programme of reform. The proposals come thick and fast – he is, in the best possible sense, a very creative accountant – but they add up to an integrated project for tying both state power and the private sector to the pursuit of a democratically established agenda. Tax Justice Focus readers won’t be surprised to hear that he wants to dismantle the offshore system once and for all. But he also proposes major changes to the onshore regime by replacing national insurance with a land value tax and a financial transactions tax. These would encourage a more efficient use of land and discourage speculation. And he is also keen to change the constitutional status of tax by replacing Her Majesty’s Revenue and Customs with an agency directly accountable to Parliament. As a tax campaigner Murphy has seen his ideas make steady progress from his home office to the agendas of the global institutions. Country-by-country reporting by transnational companies, a proposal he first made in 2003, has now been accepted by the G8 and G20 governments as a key element in efforts to reduce tax avoidance world-wide. Some of the best minds in the financial sector are hard at work trying to frustrate the reforming potential of his ideas as they play out in the OECD and elsewhere. This time he is aiming squarely at national politics in Britain. The initial response will be all too familiar to him. Well-insulated critics from the Prime Minister down cannot ignore him so they make feeble jokes instead. Through his writing and campaigning Murphy has done terrible damage to the cosy consensus that once protected the offshore sector. In The Joy of Tax he sets out to do the same to the onshore conventional wisdom. It is one hell of a fight to pick. But he’s used to apparently impossible odds. I wouldn’t want to bet against his having the last laugh.